Saint Kassiani is one of the first composers whose scores are both extant and able to be interpreted by modern scholars and musicians. Approximately fifty of her hymns are extant and twenty-three are included in the Orthodox Church liturgical books. The exact number is difficult to assess, as many hymns are ascribed to different authors in different manuscripts and are often identified as anonymous. In addition, some 789 of her non-liturgical verses survive. Many are epigrams or aphorisms called "gnomic verse." An example: "I hate the rich man moaning as if he were poor." "-Εκ γυναικός τα χείρω." " -Και εκ γυναικός τά κρείτω." His pride wounded by Kassiani's terse rebuttal, Theophilos rejected her and chose Theodora as his wife. 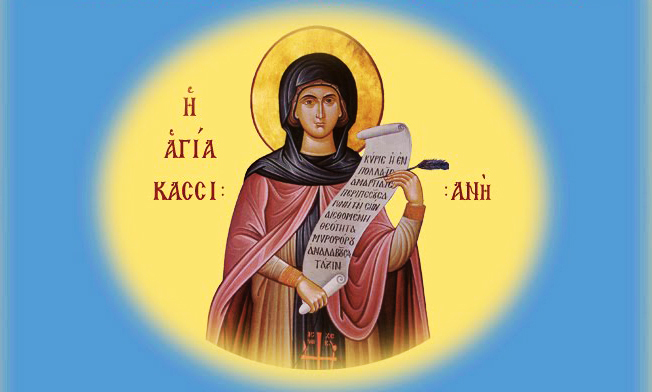 The next we hear of Kassiani is that in 843 AD she founded a Monastery in the west of Constantinople, near the Constantinian Walls, and became its first Egoumenissa (Abbess). Although many scholars attribute this to bitterness at having failed to marry Theophilos and becoming Empress, a letter from Theodore the Studite indicates that she had other motivations for wanting a monastic life. It has a close relationship with the nearby monastery of Stoudios, which was to play a central role in re-editing the Byzantine liturgical books in the 9th and 10th centuries, thus ensuring the survival of her work. "Lord!...Do not disregard me…You, whose mercy is boundless." The melodious harmony of this hymn reverberates through the Orthodox churches of the world, as the climatic conclusion of the service of Holy and Great Tuesday Evening. The faithful surrender to the waves of contrition, which descend from the chanters or choirs. The hymn spreads to the congregation the touch of another world, a world which the soul yearns for. There are few hymns which move people so deeply as this one. In a quiet, mystical way, it enters into the deepest parts of our inner cosmos. Turned into ourselves, each one of us witnesses the journey of our soul down a path of slavery and darkness, for which it was not created, and its subsequent dramatic deliverance and emergence into the Eternal Light. But what is it that is heard on the night of Holy and Great Tuesday in our churches? Is it sweet-sounding hymn? A lyrical song? Or a lamentation? It is all of these, but chiefly, it is a drama with universal connotations. An act without scenery nor actors present on the stage. The chorals are replaced by the sobs and lamentations of the one and only central heroine of the drama. The musical background is "the source of her tears," "the groaning of her heart," "the embracing and kissing" of the feet of the Lord. The dramatic act takes place before God in the human soul. Its shame is the realization of sinfulness which brings a person to contrition, and the "exodus" from the "night" of "intemperance" to the "boundless mercy" of the Savior. So is it drama? Yes, a drama without active scenery. A drama that is universal and real. Universal because it concerns all people in the world, and real because it is relevant to human life on earth throughout the ages. It is heroic, because it presents to us, the person, who stands before his sinfulness and is shaken, and confesses it, and even more heroically, looks to the "inexplorable depths" of God's great mercy to find salvation. Even though this drama begins from an episode in the life of the Lord, described by Saint Luke the Evangelist (Luke 7:36-50), it surpasses both time and unfolds beyond time in a place which cannot place where the central character, the human soul, moves between two extremes: the human tragedy--"a dark and moonless love of sin"- and the Eternity of salvation to mankind by the God-Man, Who, in His "ineffable condescension, bowed down the Heavens", Who takes the soul out of the "ecstasy of darkness", which drives it to. Of course, it is not Kassiani the nun who is "the woman who had fallen into many sins", as some thought. She is though, the poet who is anguished as she witnesses the fall of mankind. This anguish however, does not lead her to a pointless cursing of the 'fate' of humanity. She climbs onto the wings of Faith, and harbors in God's love, in order to present, with a unique sensitivity, the human pain that will eventually be healed and lead to the unending doxology of the "soul-saving Lord".